Why Join The Puget Sound Yacht Club? The Puget Sound Yacht Club (on Lake Union, near Gasworks Park) is located at 2321 North Northlake Way, Seattle 98103. 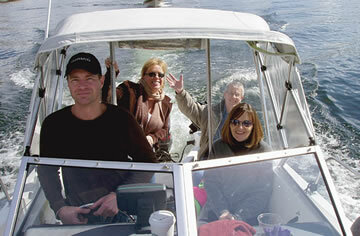 Over 50 years of Family Boating: Fun, Friendly, Good Sportsmanship, Safety! We're a "come as you are" boating club that says hello with a hug. We hold monthly dinner meetings every third Wednesday as well as First Friday informal gatherings at our own Clubhouse. We like each other so much that half our membership turns out for events. And, we have lots of events. Annual dues for 2017 are $300 which pay for dinner and breakfasts on specific club cruises starting in February and ending in December. Our members always enjoy cruising to our very own Out Station on Hat (Gedney) Island and visiting Poulsbo, Tacoma, Port Ludlow, Andrews Bay, Port Orchard and more. Take advantage of about 100 Reciprocals locally and as far away as Waikiki. Social Events happen whenever someone has a good idea. We scheduled over 10 events last year including a Lobster dinner with fresh Maine Lobsters flown in that day, “Opening Day” Weekend Celebration, Fourth of July on the Dock, a Dinner including Cigars and Whiskey tasting on the Dock, Blues on the Pier, wine tasting, dock parties, BBQ, Dock Friday socials – and more – all at bargain prices to attend. Sign Up on the Wait List for moorage on our Dock and when a spot comes open, enjoy the savings and great location. 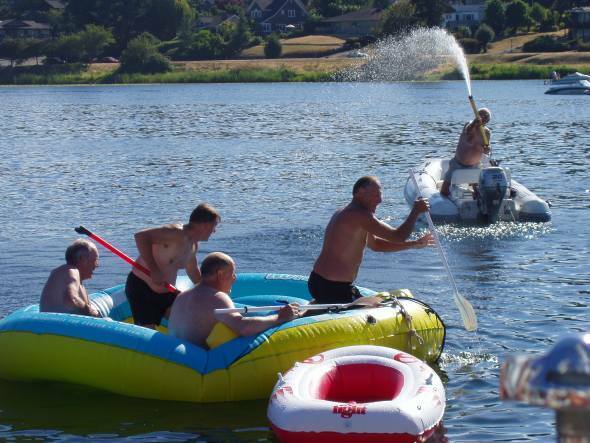 Puget Sound Yacht Club is all about family fun! "We've been boating for over 30 years...We liked the idea of the Hat Island Out Station, where we could stop on the way to/from the San Juans and play golf. We also like the reciprocal moorage availability when we're cruising. That pays for our annual dues and gets us out to new places." "Get to know the people who are going to rescue you before your boat breaks down"
"When cruising, people wave erratically at you and you instantly feel popular!" "Perfect strangers invite you to tie up to their boat and even smile during the controlled crash"
"I joined because it was the best boating bargain around." "I like to eat a lot and the PSYC has great dinners at the monthly meetings." "I knew very little about boating and figured the members would keep me afloat." "I joined the PSYC because the price to join is reasonable and I can afford it, the members are nice, fun, friendly, enjoyable to be around, and they welcome me with open arms and make me feel like one of them even though I am single. My boat is a fishing boat and I have fun at the outings, club meetings, and it is nice to have reciprocals at Hat Island and the other Marina docks. Come one, come all, experience and see for yourself how PSYC is the best club to join and belong to!" Click on the items below and we will show you what you are missing! Make new friends that share your interest in boating. At PSYC we have 12 or more cruises a year plus other opportunities for you to get out on the water using your boat. Get home safe, a PSYC boater is close at hand. Use the Club's facilities for family and personal functions. The next step: costs, forms, and contacts to make it happen.